At the end of 2017 Warren Buffett, the most successful stock picker of the 20th century, won a $1 million bet against a hedge fund manager. Buffett had bet that a passive position in the S&P 500 index would outperform a basket of actively managed hedge funds. It was a blowout victory: Over 10 years Buffett’s indexing strategy returned 7.1% compounded annually, and the basket of hedge funds delivered a mere 2.2%.Buffett isn’t the only one who’s been betting on passive strategies and winning. As U.S. equity indices climb ever higher and active strategies underperform, funds are flowing away from active and into passive strategies. To make matters worse, a longstanding caricature of active managers as value-extracting parasites has returned to vogue. As active managers at Counterpoint, we don’t like to have our feelings hurt. So we decided to address several key elements of the active vs. passive debate and reiterate our belief in the value of (some) active strategies. Passive investing has flourished since Vanguard founder John Bogle started his first index fund in the mid-1970s. Among Bogle’s key insights: Active management costs hurt returns, and active managers seldom deliver value in excess of their fees. Investors would therefore be best off investing in market capitalization-weighted portfolios that make no effort to outperform. In the ensuing decades, evidence has piled up in support of this argument. Today, it’s widely accepted that passive strategies offer diversification and systematic market exposure at a low enough cost to deliver adequate long-run results for investors. Indexing is not without its drawbacks. Passive ownership of an entire index is most attractive during the fun phase of market cycles. When investor enthusiasm drives the prices of even the junkiest investments higher, the market rewards passive ownership of companies with suspect – and even fraudulent – business models. Index strategies’ embrace of trashy investments becomes painful during downturns, when individual investment characteristics tend to return to focus. Active management offers the opportunity to identify and exclude clearly bad long term investments from portfolios; indexing does not. Market capitalization-weighted index strategies fail to account for well documented factors that contribute to investment returns. Such factors include momentum (recent outperformers and laggards tend to continue in the same direction); value (cheap stocks tend to outperform expensive ones); profitability (companies with stronger profitability ratios tend to outperform). The traditional active manager roots through company filings and market data to identify such sources of outperformance on a stock-to-stock basis. This approach is difficult to systematize. Worse, it introduces human psychological biases into the investment process. The hard-wired biases of even a very sharp and well-intentioned manager can drag on portfolio performance. But active management does not have to imply unsystematic and biased decisions. Quantitative analysis allows active managers to dispassionately and systematically allocate capital to stocks with exposure to factors that contribute positively to returns. We agree with John Bogle that fees drive performance of passive or passive-like products. We also agree that many active managers lack the skill that would justify their fees. But we believe there are two categories of active manager. First are “closet indexers,” whose strategies resemble indexing and whose results track closely to benchmarks. Second are managers with distinct strategies who choose to diverge from their benchmarks in pursuit of outperformance. The measure of a portfolio manager’s “active share” provides a good way to differentiate true active managers from “closet indexers.” Active share is the sum of the differences between a fund’s benchmark index and its own allocation. A fund with a 0% active share is allocated identically to its benchmark, while a fund with a 100% active share has no commonality with its benchmark. A study by Martijn Cremers showed that funds with low active share had negative returns from 1990 to 2015, while funds in with the highest active share were the only group that created any value for their investors. The positive return for the funds with high active share was largely driven by outperformance when the tech bubble popped in 2000. 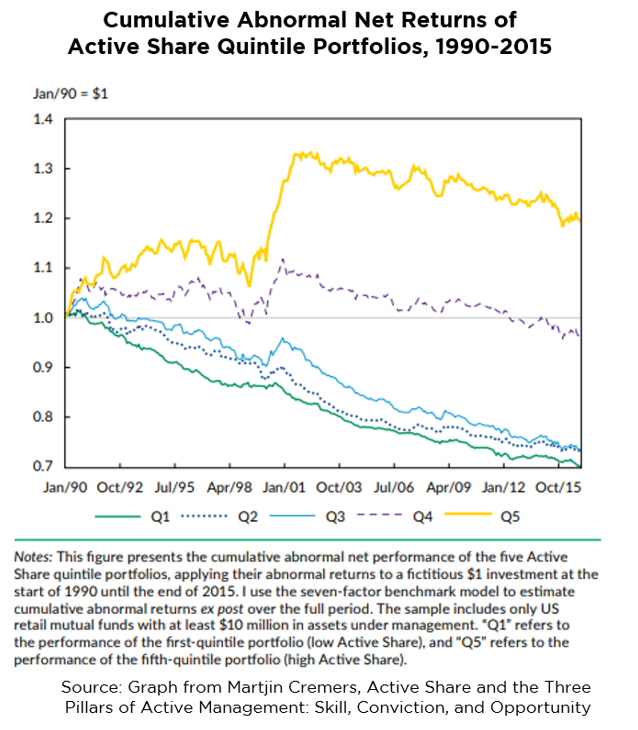 Asset allocators can draw two meaningful conclusions about active share. First, investors are better off buying an index fund with the lowest fees possible than trying to pick an active fund with a low active share. Second, investors’ only chance to realize meaningful outperformance is to invest in funds that have very high active share. This conclusion must be qualified – the measure of active share alone will not help you pick a winner; it will only provide the opportunity for outperformance after fees. We believe outperforming the market over the long run requires: 1) strategies that systematically address and exploit investors’ inherent behavioral biases 2) maximizing active share, and 3) fees set well below the level of expected excess return. Passive strategies have lately enjoyed a period of powerful performance, and they have offered advantages over many of their active counterparts. But their advantages are not inevitable, and markets operate in cycles. Strategies with high active share offer diversification benefits, the opportunity to respond to broad market dynamics, and the possibility of outperformance. Investors should carefully consider the investment objectives, risks, charges and expenses of the Counterpoint Tactical Income Fund, Counterpoint Tactical Equity Fund, and the Counterpoint Long-Short Equity Fund. This and other important information about the Fund is contained in the prospectus, which can be obtained at www.counterpointmutualfunds.com or by calling 844-273-8637. The prospectus should be read carefully before investing. The Counterpoint Tactical Income Fund is distributed by Northern Lights Distributors, LLC member FINRA/SIPC.